As Britain faces a general election, it's clearer than ever that Scotland is a completely different country. The UK general election campaign is upon us – struggling to make sense of the state of the country and how its institutions and politics are seen. Underneath all the political rhetoric and exchange we are about to witness is tangible anxiety and unsureness about who ‘we’ are and the very existence, or not, of a ‘we’ in terms of connection, culture and collective memories - which can be found equally on both left and right. Scotland has become one of the key reference points of this election: continually cited by the Westminster class and media, but seldom if ever understood. It wasn’t meant to be like this. The indyref was won 55:45 for the union. The issue was supposedly in David Cameron’s words ‘settled’, Alex Salmond seen off the political stage and the SNP juggernaut checked, if not stopped. Scotland is at a seismic moment with huge implications and long-term repercussions not just for Scotland but the UK – as what increasingly looks like a tartan tsunami could sweep away scores of Labour once impregnable bastions north of the border. Viewed from Scotland, so much has changed and shifted that it is almost impossible to convey - politics, society and attitudes, but more critically how things are perceived, felt and what is now deemed possible or not. The reference points in Scottish politics and public life have dramatically changed. This extends way beyond the SNP’s massive influx of members, away to hit 100,000 in the next couple of weeks, or the flatlining of the Scottish Labour Party. Society feels different. The referendum has produced a dramatically different political landscape which is disguised by many of the institutions, players and language being the same as before. An impressive 76% of Scots say they intend to vote in the general election compared to 63% in England; the figures for 18-19 years are even more pronounced: 65% in Scotland, 34% in England. 85% of Yes supporters plan to vote SNP in May, whereas No supporters divide 44% Labour 36% Conservative 7% SNP and 7% Lib Dem. Every single Scottish opinion poll for Westminster since the indyref has put the SNP significantly ahead of Labour – sometimes by huge margins. SNP First Minister Nicola Sturgeon has a 62% approval rating; Jim Murphy, Scottish Labour leader is struggling and has seen his approval ratings fall from 33% in February to 26% in March. The national swing projections point to the possibility of the SNP winning 40-50 seats. The individual Ashcroft constituency polls paint a similar picture – and one of Labour and Lib Dem wipeout north of the border (the Lib Dems holding 11 of Scotland’s 59 seats in May 2010). All of this points, Peter Kellner said, to a watershed – ‘a once-dominant party condemned by voters – its leader rejected, its remaining supporters lukewarm’ and facing ‘a popular, fresh-faced rival’, evoking the spirit and scale of change of 1997 (1). One of the principal obstacles to this SNP induced tartan tsunami could be the electoral geography of Scotland and absence of Labour-SNP marginals. Thus, the SNP need a big swing to win big in seats: a 10% swing from Labour to SNP would only produce two SNP gains, a 15% swing 19 gains, and a 22% swing 36 gains. Tory strategy has been to hurt Labour on two interconnected fronts. Firstly, they aim to weaken them in England scaring voters with the spectre of a Nationalist threat having influence at Westminster. Secondly, they talk up the SNP in Scotland to further undermine Labour. Both increase the prospect of Cameron remaining in Downing Street after the election. This is smart short-term electoral tactics, but one far removed from the pro-union message in the indyref. Where does this take us beyond the political rhetoric? Beneath this the differences between Labour and SNP are less than first appear, but magnified by language, tribalism and intense electoral competition. A British Election Survey at the end of last year showed that SNP voters thought they were the most left-wing of Scotland’s mainstream parties and their party the most left-wing with Labour as significantly to their right; while Labour voters thought the same of themselves and their party, and placed the SNP to their right. Both sets of voters maximised the difference between the two in terms of where they thought they and their parties stood. But comparing Labour and SNP voter self-perceptions of themselves and their party put each in the same place on the political spectrum. This is the fetishisation of micro-difference, one not unique to Labour and SNP, but just taken to a grotesque level by both. 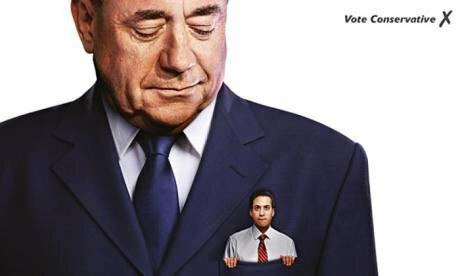 Post-election the SNP are going to have to deal with success and a much larger Westminster group. If it finds itself in a ‘kingmaker’ role in a hung Parliament it will have its every move forensically scrutinised. In a similar position in the October 1974-79 Parliament (which for a large part of the time had a minority Labour Government), the SNP’s parliamentary votes caused intense political controversy. The SNP have to develop a new raison d'être as it becomes more difficult to pose as simultaneously both insurgents and incumbents north of the border as they morph into the new political establishment. They have to find a rationale for the party between what increasingly looks likely to be two independence referendums – with the second if it occurs unlikely to be just one or two years away. Historically the SNP has seen its role as to articulate and defend Scottish interests (plural) and what is seen as ‘the Scottish interest’ (singular) with all this implies. The latter wordage has resonance particularly in relation to how Scottish politics has approached Westminster and the UK. One problem with this is that it has traditionally embodied a defensive politics, based on the power of the Scottish lobby, corporatisted interests, and pork-barrel politics. This after all was the glue which held together Labour Scotland for so long. All of this has less Westminster traction as devolution evolves. For example, future Scottish devolution of income tax could lead to Scots MPs not voting on the income tax provisions of the UK Budget. Scottish Labour face even more difficult pressures. Jim Murphy, despite three and a half months of hyperactive leadership and pronouncements, seems to have made little positive impact on the political weather. There has been no discernible ‘Murphy bounce’. Not all of this can be laid at his door; and goes deeper than Labour’s alliance with the Tories in the ‘Better Together’ alliance in the referendum. There are long, historical causes for Labour’s decline and predicament: one being the character and culture of how Labour administered and ran Scotland for decades, another being the absence of any positive agenda of what the party should do under devolution. The party is in a state of shock and denial. Labour MP Douglas Alexander this week blamed ‘conspiracy theories’ on social media for why Labour has ended up where it is. He cited, at a Labour List event, the experience of speaking to a woman in a supermarket who said ‘I’m never going to vote Labour again’ and that the referendum had been ‘a conspiracy’ because ‘everyone I know voted Yes’. That’s the kind of short straws Labour’s senior figures grasp at in public. Whatever happened to the centre-left case for the union? A fundamental problem for Labour and pro-union opinion in Scotland is not just the overall decline of unionism but also the retreat of any sense of progressive unionism. Labour’s lack of surefootedness in the present day Scotland is illustrated by some of Jim Murphy’s statements since becoming leader. He has said on many occasions that he is ‘not a unionist’ (a label which still has certain religious and sectarian connotations in parts of the West of Scotland). Even more revealing, Murphy has several times, despite being a career Westminster politician, tried to distance himself from the institution. He has risibly stated that ‘I’m not a Westminster politician’, trying to make the distinction that he is a Scottish politician who just happens to sit in Westminster. Such is the way the British political system is now seen in large parts of Scotland and the UK. Labour used to be able to tell a convincing story in Scotland which presented the positive case and benefits of the union and set out an enlightened, benevolent and progressive unionism. This has become problematic over time. Under the Thatcher and Major Governments Scottish Labour adapted to a quasi-nationalist language which defined 1980s Scotland. Subsequently, in the early years of devolution Labour adopted an abrasive unionist message – ‘Divorce is an Expensive Business’ – which jarred with many voters, even if in the short-term it had some effect. Labour’s unionism was always different from Tory unionism. It was instrumental and about the union as a means to an end, not an end in itself. As the UK has become less progressive and more unequal, Labour’s unionism has morphed to being an end in itself and an intrinsic politics. This fundamental shift is anathema to a progressive, centre-left party and one Labour seems to have barely any understanding of. Is the union then just over or facing an uncertain time and future as it heads for the rocks and possibly divorce courts? How has this come about so quickly from the ‘glad, confident new morning’ of 1997 and the hyperbole of the ‘New Britain, New Labour’ era? This was an era where Gordon Brown and Douglas Alexander acclaimed the union as ‘a partnership for social justice’ and ‘the greatest multi-national union in human history.’ The trouble was they believed their own hollow rhetoric which grew in inverse proportion to the state of the union, while in typical Labour fashion, despite copious speeches and Smith Institute pamphlets, no detailed definition of social justice was ever offered. One analogy about the state of union made by writer Alex Massie and others is to see the coming SNP wave at Westminster as a 1918 moment. This is a reference to the election of 73 Sinn Fein MPs at that contest: a precursor to Irish independence. Massie observed, looking back to 1918, that, ‘We’ve not seen anything like this’ since then, and continued with foreboding: ‘And you will remember what happened after that’. The comparison is a powerful, but ultimately false one. For a start, Scotland and Ireland’s place and history in the union has been very different: Ireland was conquered, Scotland wasn’t and became a ‘junior partner’ in the British imperial project. Their societies and economies equally have reflected very different stages and paths of development. Even more pertinent for today, the nature of Sinn Fein in 1918 and the SNP in 2015 could not be starker. Sinn Fein ran on an abstentionist ticket in 1918 and once elected set up a Dáil in Dublin. One of the fear factors of the Westminster class with the SNP is the exact opposite: that the expanded Nationalist group will take their seats and make their presence felt. Westminster insiders seem to be intent on belatedly attempting to stigmatise the SNP as motivated by wanting to ‘break up our country’ (Cameron’s words) – when everyone knows the SNP’s pro-independence stand. The 2015 Westminster election isn’t going to end or validate the union in Scotland – that was decided for the time being in last year’s indyref. A more apt comparison would be the role of the Irish Nationalist Party who are most associated with the leadership of Charles Stewart Parnell and who between 1885-1910 elected between 70-80 MPs at each contest, and played a high profile and influential role at Westminster. This has some common ground with today’s emerging political situation. The Irish Nationalists were seen by many as part of the Gladstonian anti-Tory progressive (and informal) coalition: one which was informed by an incremental politics of self-government. Inappropriate comparisons with 1918 underline the confusion and denial at the heart of unionism, air of fin de siècle decline and the passing of an era of Britishness. Large parts of pro-union opinion are in a state of shock and confusion. English unionism is in a bad place, part denial and part anger about where the union is and what has happened to it. There is a lack of understanding about how things have come to this impasse – with indignation and rage directed at a number of targets from Labour’s devolution plans of 1997-99 to the SNP and wider Scottish independence movement. Scottish pro-union opinion – despite winning a majority in the recent referendum – acts and feels that it lost if not the vote, then the debate and aftermath. In Scotland, this often expresses itself in a bitter and heartfelt cry about the current mood of Scotland and complete misreading of the public mood and pro-independence opinion. In a typical example in ‘The Guardian’ this week a letter from Aberdeen complained of ‘nationalists still smarting from ancient battles lost, and deep-seated inferiority complexes leading to selective racism, namely Anglophobia’. Then there are the London Scottish class of commentators and opinion formers – such as Fraser Nelson, Hugo Rifkind and Iain Martin. Their take on the union contains emotional and elegiac elements, filled with sadness, detachment and an over-romanticisation of a union which is in both the political, and their personal, past. There is a mourning for the passing of a Britain and Scotland which no longer exist. The palpable feeling that Scotland has been ‘lost’ to the union, which for some has connotations of proprietorial ownership, and that the country has been utterly and irreversibly changed is painful for some. This is cause for dismissal and celebration in many pro-independence voices, but it should be heard and acknowledged. In the indyref many pro-union people asked warily, ‘what happens if I wake up on September 19th in a different country?’ One answer was of course that a different country was already here, and was being made and remade in the independence debate. What that response didn’t recognise was the existential depth of that observation, one which is about profound grieving almost amounting for some to a family death. There has to be an emotional intelligence to this dimension, irrespective of whether people are pro or anti-independence. There is a missing story of British popular unionism which is being filled by confusion, anxiety and xenophobia – one articulation of which can be seen in the rise of UKIP English nationalism – which has become increasingly irritable not just about Europe and immigration, but Scotland and Scottish nationalism. ‘The Times’ writer and former Tory MP Matthew Parris said recently that, ‘The union died last year during the Scottish independence campaign.’ He continued with an audible sense of regret, ‘The union is over; the general election will confirm it’. May 2015 will not be as black and white as Parris writes. The above says much about the pessimism and dislocation of part of English elite political opinion: one which has had its way for so long and now feels the ground move under their feet. The forthcoming election is part of a longer set of changes and transformation, and one more staging post in Scotland’s political development, growing autonomy and detachment from the rest of the UK. Scotland is marking out a direction and territory of its own. This is increasingly defined by a de jure independence – what I have described as an ‘independence of the Scottish mind’ – whereby Scottish politics, public life and the public sphere act in an increasingly autonomous and distinct way as if Scotland were independent in how it thinks, acts and sees itself. One illustration of this is an Edinburgh University study this week which showed that 69% of Scots believe it is inevitable that Scotland will be independent. Scotland is not going back to normal service now or anytime post-May general election. The same of course is true of UK politics. The difference is with the UK that statement underlines the sense of doubt, fatalism and fear over the future which characterises the dynamic of Westminster politics. Whereas north of the border, for all the political imperfections, there is a genuine sense of optimism, hope and belief that a better collective future can be created – qualities singularly missing from British politics. Scotland is continuing on its ‘revolution of the normal’ and its desire to be progressive, democratic and European: mainstream sentiments but ones increasingly at odds with the direction of British politics. Peter Kellner, ‘Little time left for party to prevent an SNP landslide’, The Times Scotland Edition, March 13th 2015.